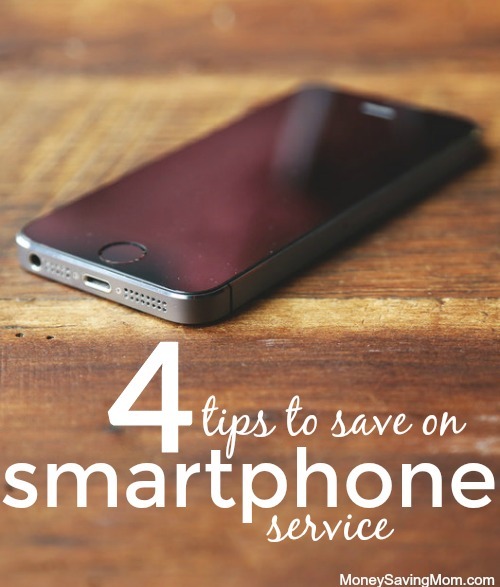 One thing that I often see when looking at money-saving ideas is to get rid of your smartphone. It’s usually assumed that smartphone service is very expensive… however, that isn’t always the case! My husband and I have two smartphones, a Samsung Galaxy S5 and a iPhone 6s. We pay a combined household total of no more than $30 per month (occasionally less than that). This includes unlimited texting for both phones, unlimited minutes for both phones, and 2.5 GB of data per phone. (We don’t get overages on data though. When we use up our data, the speed just slows down). We use Cricket Wireless. Here’s the tips that have helped us to keep our bill so low. Monthly contracts keep you locked into the same provider for long periods of time, reducing flexibility. They also “bake in” the price of that discounted smartphone and more, actually costing more in the long run than paying full price for a phone. It’s cheaper to purchase your phone up front and go with an out of contract option. We chose Cricket Wireless, which does solely month-to-month service with no contract option. If we don’t pay our bill on time, we just wouldn’t have service until it’s paid. If I had been unable to find deals on iPhones, I would have gotten an Android. Our current provider, Cricket, offers amazing discounts on multiple lines. They allow up to 5 lines on the same account. We found 3 other friends who also wanted to save money and added them to our account. The cost is lower for all of us this way. 4. Find discounted refill cards. Sometimes we can find Cricket refill cards for sale online at a discounted rate. One time we found a $30 refill card for $27 and another time we found a $30 refill card for $28.50. That doesn’t save a huge amount, but since it only takes about 5 minutes to buy the refill card and add to our account, it’s actually a pretty good “hourly wage” for very minimal effort. We enjoy smartphones because of the many perks on them, such as budgeting apps, GPS, etc. It’s good to realize that for those who prefer to keep them, there are ways to keep the cost very reasonable. Ruth has 3 kids, ages 10, 7, and 4, and homeschools. Her family has recently become debt free and are always looking for ways to continue to manage their resources well. I also recommend checking out Republic Wireless (only certain phones can be used but month to month, no contract) or Ting (month to month and variable service plans). We have used RW for over a year and live it. I have the unlimited talk and text for $12/month. We have been using Ting for over two years and love it! We have four phones (two parent and two kid phones), and our monthly bill is $54 – $60 a month. How good is your coverage in your area? And when you travel? We use Cricket too! Great coverage here in Alabama. I signed up for their rewards and have earned $20 in gift cards to Amazon, Ebay, and CVS! I just log in each day and watch a video, answer a question and sometimes they offer free bonus points. We love cricket! So much less expensive! I don’t understand how you can get down to $30 for 2 phones a month. The best I can figure is 5 lines with the group discount 40+30+20+10+0=100 total bill, so $20/line which means 2 lines would be $40/month. Are there some extra discounts beyond saving a few dollars on lower add on cards? I was coming to ask the same exact question as Mary! I literally JUST got Cricket a week or two ago, and it is my first smartphone ever. My math is the same as Mary, so I’d love to know how you got two phones down to $30 because I’m also figuring $40. Thanks for any tips you might have! When you have 4 lines, the cost is $100. When you add the 5th line, the cost is still $100. If you charge the 5th person a nominal monthly fee for being on your plan, it’s cheaper for them than being on their own plan and reimburses you for your effort in administrating the group plan. In other words, we had two other people (not related to us) join our plan. Our cost was $50 for our two lines and so was theirs. We added a 5th unrelated person to our plan. We charged the 5th person $20/month to join our plan. That was much less than them getting their own line and helped them keep their expenses low, as they are in college. For those interested in Cricket refill cards, they are currently on sale for 10% off at target.com. I second the comment about Republic Wireless! My husband and I have been with them for over a year and combined, we pay less than $30/month after all taxes, etc. Another way to save is to purchase a phone service refill card online at Target with a Target RedCard. That gives you an additional 5% off. If you have a Target RedCard you can get an additional 5% off phone service by purchasing refill cards with that. Oops, posted about the RedCard twice because my first comment initially didn’t show up.